The Cappella Singers were founded in 1960 by the late Mark Foster. We sing music of many styles and periods, both sacred and secular, serious and light-hearted. Usually we sing unaccompanied or with organ or piano. Occasionally we are accompanied by instruments, for example an ensemble of cornetts and sackbuts. We have commissioned several works, most recently Seas of Tears, a setting of a new poem by local poet Frances March, composed by Matthew Clark, who sings at Gloucester Cathedral. This work received its first performance in our concert on 10 November 2018. 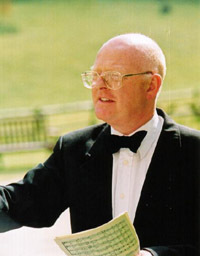 Philip Colls, a native of Yorkshire, has been our Musical Director since 1981. He has sung successively with the cathedral choirs of Carlisle, Peterborough and Gloucester. For many years he taught Music and French at the High School for Girls, Gloucester; and also Music at Rendcomb College Junior School. When not on duty, he spends most of his time in the kitchen or attempting to solve crossword puzzles. Our Committee consists of a Chairman, Treasurer, Secretary, Minutes Secretary, Social Secretary and Publicity Officer. The Musical Director is an Ex Officio member. Committee members are elected at the choir’s AGM, usually held in May. The choir is a Registered Charity (no. 262530).